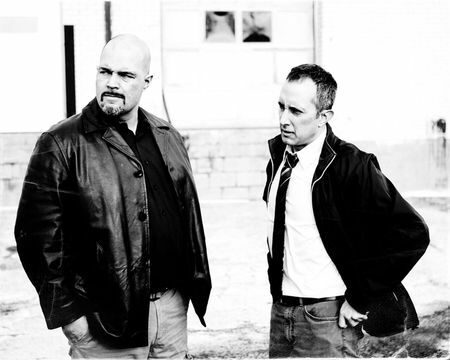 Playing at Leslieville’s The Grocery, A Steady Rain by Keith Huff is a riveting tale of two troubled cops. You’ll be hanging on to their every word. They face the horrors of Chicago criminal life as well as their own chronic, personal battles. Despite their best intentions, everything at home and on the beat goes wrong, and things progressively get worse. Denny (Anthony Parise) had a strong presence; he was fast-talking, hot-tempered and leather-clad. I liked the staccato of his patter, which he punched out with fervour, complete with grammatical flaws and four-letter words. Joey (John Palmieri) was subdued, pensive and soft-spoken. Slouched and unassuming, he spoke in drawn-out thoughtful sentences. The two cops complemented each other. Their friendship was touching: Denny made Joey a member of his family, inviting him for home-cooked meals with Denny’s wife and kids, so Joey wouldn’t drink his loneliness away. And Joey would calm Denny down when he’d shoot off his mouth or act stupidly on impulse. Joey was Denny’s voice of reason. Walter, Willy, Connie, Stewy, Rhonda were also important to their struggles. We never saw them on stage, but for me they were entirely real. I felt I knew what they looked like and how they talked and moved, just from hearing about them from Joey and Denny. Keith Huff’s evocative writing gave these characters their colour. The details made them come to life: Willy’s desire for a puppy, Rhonda’s baby in the dresser drawer. The set was simple: a table and two chairs with some crime scene information pasted on the back wall. It was enough for me, since the play was all about the words and their delivery. I thought that A Steady Rain was like a novel that kept you turning the pages. At the middle of the book, you think you know the characters. But as you near the end, the characters make more revelations, and the story ends with a bang. You’re in shock, so you flip back through the earlier pages to find hints of the final disaster. And you find them. Because the playwright Keith Huff has weaved in foreshadowing details throughout the monologues. My friend liked the intimacy of this Leslieville venue; we were up close and personal with the actors. The Grocery was formerly a store, so its small size allows for only a few rows. I found it a bit grimy, but I guess that matches the underbelly of these crime-ridden streets of Chicago. Shows on January 25 run at 2 p.m. and 8 p.m.